The paste-down is the portion of the endpaper that is glued to the inner boards of a hardback book. The paste-down forms an essential part of a book's structure, and along with the exterior binding of the book, comprises the hinge of the book's cover. 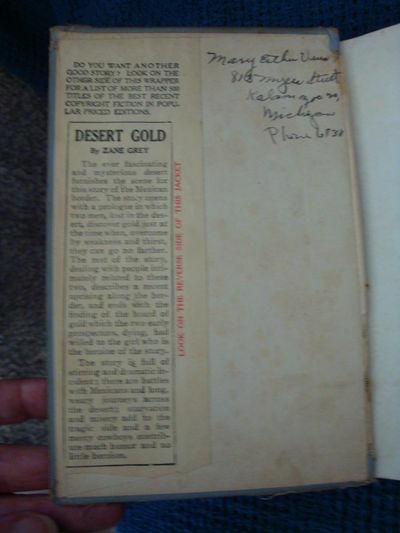 The paste-down keeps the text pages of the book in place, and fixed to the cover. In addition, the paper covers the inside edges of the book's binding. A modern paste-down is a single page, and includes the flyleaf. In the past, a fancier version of both the paste-down and flyleaf was called the doublure, and was usually made of two parts, a silk flyleaf and leather board covering. The paste-down and the flyleaf are both common places for inscriptions and signatures. This illustration shows an example of a paste-down with a previous owner's name inscribed, also showing the inside edge of the dustjacket.